Rooftop installations comprise growing percentage of the region's power supply. 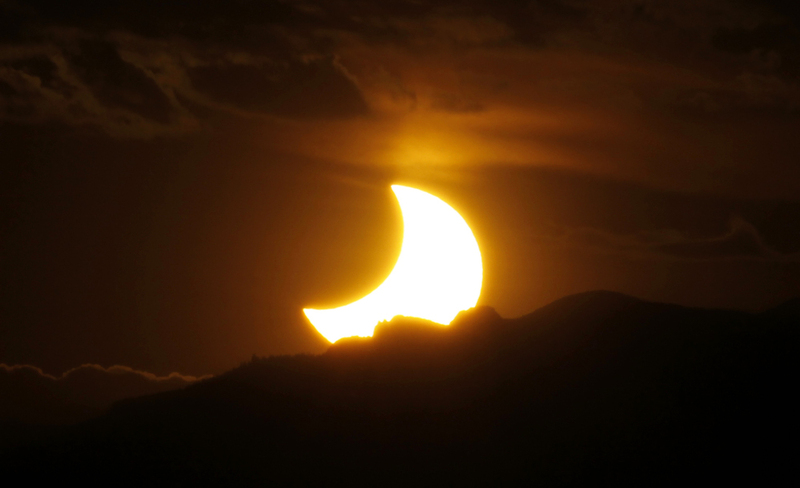 The annular solar eclipse is seen as the sun sets behind the Rockies from downtown Denver on May 20, 2012. Rooftop solar electric panels now generate enough power in New England that the region’s grid operator likely will need to fill the gap with other power plants when a solar eclipse crosses the United States on Aug. 21. Roughly a month from now, a total eclipse will take place, blocking the sun’s rays along a path from Oregon to South Carolina. The Northeast will experience only a partial eclipse, with 65 percent of the afternoon sun obscured. But, if it’s a sunny day, ISO-New England expects generation from the region’s 2,000 megawatts of solar to fade for nearly three hours. That short-term loss could roughly equal the output of the 1,244-megawatt Seabrook nuclear power plant, the largest generator in New England. The impact could be even greater on a national level, according to calculations by Bloomberg Technology. It found the eclipse could reduce output to 7 million homes. It calculated that more than 9,000 megawatts of solar power could go offline, equal to the output of nine nuclear plants. California, which relies on solar for roughly 40 percent of its power on some days, is gearing up to fill the gap. CASIO, the California Independent System Operator, will buy 200 megawatts of reserve generation from wind, natural gas and hydro resources, the agency says. The fact that preparations are being made in New England for a rare eclipse indicates that solar energy is beginning to make a real contribution to the region’s electricity supply, with much of it coming from rooftop-scale installations. By 2026, ISO-New England expects installed capacity to more than double. Solar remains a tiny portion of the region’s capacity. On a typically sunny day in Boston, with temperatures in the 80s, natural gas-fired power plants supply more than half the power in New England. Renewables contribute 5 percent or so, most of that coming from biomass and trash-fired generators. Solar is a small fraction. But on an annual basis, ISO-New England calculates, the 2,000 megawatts of installed solar capacity lower demand on the grid by the equivalent power needs of 335,000 homes. Solar’s output is most valuable on hot, humid days when residents crank up air conditioning. Fewer, high-cost power plants need to run during those hours, because solar homes and businesses aren’t taking their energy from the grid. The ISO’s expectations for solar are summarized in its latest forecasting report, which calculates how much capacity will be installed through 2026. Maine isn’t expected to make much of a contribution to the region’s solar growth, because – at least for now – it lacks state policies that encourage it. The 2017 PV Forecast (PV for photovoltaic, or solar electric) takes into account shrinking federal tax benefits for solar installations, as well as a mix of local incentives in each of the six states. It estimates total installed capacity will grow from 1,918 megawatts in 2016, to 3,552 megawatts in 2020, and 4,732 megawatts in 2026. More than half will be installed in Massachusetts, an estimated 2,843 megawatts. By contrast, Maine is expected to be last, with an estimated 83 megawatts. The ISO forecast shows growth coming from what’s known as behind-the-meter installations. Unlike utility-size projects, these rooftop-sized installations are too small to be directly connected to the grid. They also can’t be monitored by control room operators. Operators need to match electric supply and demand, minute-to-minute. Because sunshine is so variable – influenced by passing clouds – ISO-New England is using sophisticated weather forecasts that include solar irradiance, a unit of measure of power from the sun. That’s why a solar eclipse presents a novel challenge. ISO-New England said it will consider several variables in deciding what mix of alternative generation it needs for the duration. In a partial eclipse, sunlight will be emitted around edges of the passing moon, so some electricity will still be generated. The sun angle is lower in August than now, so the reduction will less extreme. Also, the eclipse won’t be maximum until 2:44 pm – past the noon solar peak. Cloud cover also matters. The impact would be greater on a clear day, when solar panel output is highest. The August eclipse will serve as a test run for a larger event coming April 8, 2024. That’s when total eclipse is due to pass over Maine and part of northern New England, shading a growing number of solar panels.